Shenanigans aside on the meta board. 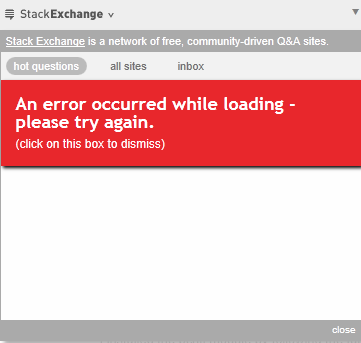 :) I get this message pretty frequently when I click on the StackExchange logo at the top. If I click on the error to dismiss, I can then click on any of the links, hot questions, all sites, inbox, with out any issues. I'm using IE9. I've tried using it in compatability mode with the same issue. on meta only or on other sites? I can't repro this, and we've heard of no other instances.. can you try in a different web browser just to rule out potential browser configuration issues? Anyone having trouble loading pages from Serverfault?